Publisher's Description: Teaches young readers about metamorphosis by watching an impatient caterpillar learn patience as he morphs into a butterfly. Publisher's Description: It seems that wherever Aria goes, someone wants to touch her hair. In the street, strangers reach for her fluffy curls; and even under the sea, in the jungle, and in space, she's chased by a mermaid, monkeys, and poked by aliens...until, finally, Aria has had enough! Publisher's Description: Everyone knows that when Humpty Dumpty sat on a wall, Humpty Dumpty had a great fall. But what happened after? Humpty Dumpty, is an avid bird watcher whose favorite place to be is high up on the city wall—that is, until after his famous fall. Now terrified of heights, Humpty can longer do many of the things he loves most. Publisher's Description: A very talented little girl has a very special night ahead of her. A night where she'll get to wear a new dress in the most beautiful shade of blue with shoes that match it perfectly. A night where she'll get to ride in the biggest car she's ever seen! A night that will, of course, include ice cream. Publisher's Description: When a young dancer is nervous about her upcoming auditions, her shadow springs to life and leads her on a joyous exploration of their city. Soon enough, the young girl finds confidence in her skills, her body, and her ability to shine. Publisher's Description: Free verse poetry and colorful illustrations celebrate the nature of love and the ways children experience it throughout their childhood, from parents' voices lulling them to sleep to the love of a street singer playing his music. Publisher's Description: A girl is lost in a snowstorm. A wolf cub is lost, too. How will they find their way home? Publisher's Description: The barbershop is where the magic happens. 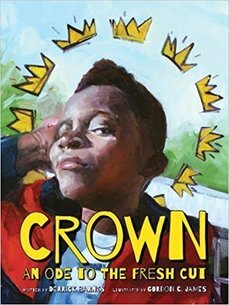 Boys go in as lumps of clay and, with princely robes draped around their shoulders, a dab of cool shaving cream on their foreheads, and a slow, steady cut, they become royalty. That crisp yet subtle line makes boys sharper, more visible, more aware of every great thing that could happen to them when they look good: lesser grades turn into As; girls take notice; even a mother’s hug gets a little tighter. Everyone notices. Publisher's Description: As a young boy, Bao Phi awoke early, hours before his father's long workday began, to fish on the shores of a small pond in Minneapolis. Unlike many other anglers, Bao and his father fished for food, not recreation. A successful catch meant a fed family. Between hope-filled casts, Bao’s father told him about a different pond in their homeland of Vietnam. Publisher's Description: La Paz is a happy, but noisy village. A little peace and quiet would make it just right. ​So the villagers elect the bossy Don Pepe as their mayor. Before long, singing of any kind is outlawed. Even the teakettle is afraid to whistle! But there is one noisy rooster who doesn't give two mangos about this mayor's silly rules. Instead, he does what roosters were born to do. Publisher's Description: When a housebound dog spies a cat, a bird, and other animals outside a glass door, he is excited: I see a cat. I see a bird. I see a squirrel. When the dog’s beloved boy comes home from school, the two pals dash outside determined to get up close and personal with all the backyard wildlife! 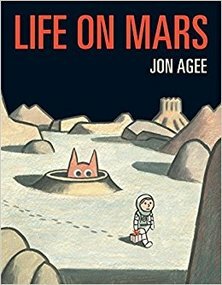 Publisher's Description: A young astronaut is absolutely sure there is life to be found on Mars. He sets off on a solitary mission, determined to prove the naysayers wrong. But when he arrives, equipped with a package of cupcakes as a gift, he sees nothing but a nearly barren planet. Finally, he spies a single flower and packs it away to take back to Earth as proof that there is indeed life on Mars. But as he settles in for the journey home, he cracks open his cupcakes--only to discover that someone has eaten them all!